Since we love trying weird foods and candies, The A.V. Club periodically features Taste Tests. Feel free to suggest disgusting and/or delicious new edibles for future installments: E-mail us at tastetest@theonion.com. Mother Nature is pretty unambiguous when it comes to telling interlopers which of her creations to stay away from. Pointy spikes, foul odors, unappealing appearances and/or tastes: These are just some of the ways she communicates that certain things are not to be trifled with. And yet the durian fruit, which has all of these things, is grown, harvested, and sold for the consumption and purported enjoyment of humans the world over. And yet, given the fruit’s prevalence as a flavoring in candies and confections in its native Southeast Asia, clearly there’s a demand somewhere for its pungent charms. But here in ’Merica, we like our fruit sweet, fragrant, and preferably stuffed into pie crust. So outside of a few delusional/contrarian foodies, most people here who consume durian do it out of curiosity and novelty, taking Mother Nature up on her sharp, stinky dare just so we can say we did it. That’s where The A.V. Club comes in. After all, the words “curiosity” and “novelty” are emblazoned on the Taste Test crest, right between the words “limited-edition” and “ewwwwww.” Durian has been a frequently requested subject since this column’s inception, but thanks to its reputation and difficulty to obtain, it’s been conveniently overlooked in favor of foods less reminiscent of rotting garbage. That is, until designer/Taste Test quipmaster Jun came across a specimen in a local Asian market and brought it into the office, probably flouting several local ordinances and HR policies in the process. We could ignore the garbagefruit no longer. We also couldn’t ignore the fact that it would be exceptionally poor form to crack open this biological stinkbomb in the middle of a crowded office—specifically, in the kitchen across from long-suffering HR manager Shannon, whose office is already shrouded in a cloud of the mingled aromas of Taste Tests past. After a quick consideration and dismissal of the fire escape as a temporary tasting venue, we decided to tote the durian downstairs to an outdoor alcove along the sidewalk in front of our building. But even though it was swaddled in plastic and placed inside a duct-taped cooler, the durian still managed to release a few noxious fumes on its journey out of the office, attracting a couple of curious onlookers and irritating everybody else. Once outdoors and exhumed from its Styrofoam chamber, the demonfruit effectively quadrupled its stink-power, drawing alarmed glances from a few unfortunate passersby. And this was before we even attempted to hack into it. The reaction to the durian’s odor varied from person to person, but the consensus seemed to be that it was comparable to a Dumpster full of rotting fruit. The initial impression is that of garbage, but after a few minutes, an unpleasant sweetness becomes apparent. It’s not a smell anyone would want to bottle and sell as body splash, but it wasn’t as face-meltingly awful as durian lore would have you believe. (Though a couple of weak-willed Taste Testers who scampered away after getting a good whiff—ahem, Josh—might beg to differ.) 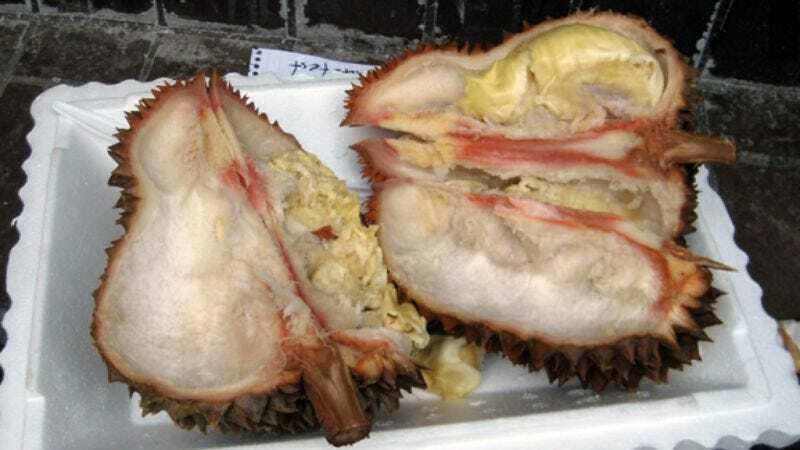 It’s worth noting that our specimen was exceptionally ripe—Jun was able to rip into the spiny shell with his bare hands—a condition that could explain both the rotten and sweet notes. Durian’s smell also reportedly varies among its 30 or so species, and being that we have no clue which variety of durian we were dealing with, it’s impossible to say how representative our sample was of the universal durian experience. Maybe the most unpleasant aspect of the durian is what the flesh looks like once the hard outer shell is cracked open. “Flesh” has never been a more accurate descriptor: The plump, oddly shaped, grayish pods have an unsettling sheen and malleability that seems natural yet extraterrestrial at the same time. Think of it this way: Durian flesh would make an excellent stand-in for an alien fetus in a low-budget science-fiction thriller. Even if the durian smelled like some otherworldly combination of puppy’s breath and unicorn farts, putting it in your mouth would be an unpleasant proposition. Taste: Not surprisingly, only a few tasters stepped up to the challenge, but those who did were, for the most part, not completely traumatized. Kyle gagged and spit his bite out pretty much the instant it hit his tongue, but the rest of us managed to chew, swallow, and in a couple of cases, even go back for a second bite. The taste was much sweeter than expected based on the descriptions we’d read, but it was still disconcertingly savory for something calling itself fruit. There’s a definite oniony essence that comes more from smell than taste; hold your nose, and it becomes comparable to an overripe guava or banana that someone rubbed all over his feet. The consistency is pulpy and a little custardy—it would be easy to shmear this stuff on a bagel you wanted to ruin completely. Or maybe not; truthfully, most of us found the durian to be surprisingly not terrible, though it’s doubtful any of us would seek it out, as evidenced by the fact that roughly 95 percent of the fruit remained uneaten, and was ultimately thrown into a nearby Dumpster that didn’t quite manage to mask the dissected fruit’s smell. But then again, why endure the stomach-turning odor and the possibility of being maimed by the rind for a taste that is just “not terrible”? Based on its looks, smell, and feel, durian wants us to leave it alone. We should probably give it what it wants. Where to get it: Assuming you want to? Durian is reportedly grown in the U.S. in Florida and Hawaii, but outside those areas, your best bet is to hit up an Asian grocery.